In November 1992 Llew, Mara, Sandy Evans & Tony Gorman and poet Stefan Kozuharov, created the acclaimed Sezoni suite especially for Mara! and Martenitsa Choir to perform together. Sezoni was recorded in 1995, released on Rufus Records in 1996 and internationally on Real World records in 2000. In 1997, theatre director Nigel Jamieson, on hearing this music, was inspired to use it as the basis of a new work with physical theatre company Legs on the Wall, called “Homeland”. Nigel had previously directed projects with Legs, and directed Mara in "Flamma Flamma" which opened the Adelaide Festival of Arts 1998, and Llew in "Kelly's Republic" at the Sydney Festival 1997. "Transforming the face of the AMP Building and Customs House Square into massive stage, Home Land is a soul stirring production, highlighting the struggle and courage which lies behind the many stories of refugees and migration, so relevant in today’s uncertain times. Set to the delightful resonating sound of Bulgarian song from the Martenitsa Choir, Sydney's 20 member Bulgarian chorus, and joined by the ARIA award winning Mara! 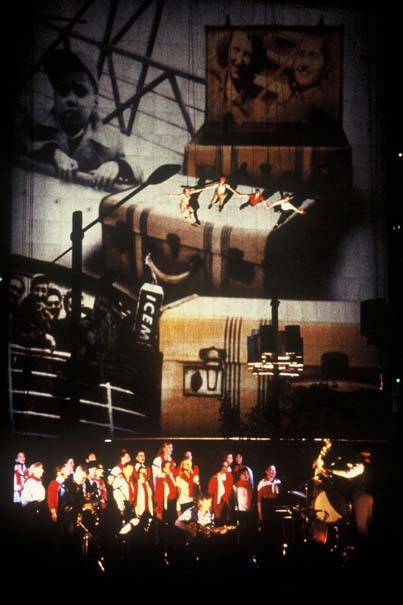 world music ensemble, LOTW performers utilise an extensive aerial technology to enable them to traverse and descend the imposing 115 metre vertical stage which is aglow with huge projected images of migrants and their journey across no-man's land. Performers Beth Kayes, Brendan Shelper, Debra Batton and Gavin Robins continue the distinctive LOTW style of physical theatre which relies on gravity defying technique, acrobatic skills and aerial imagery woven with a strong narrative. Their work challenges our expectations of theatre and brings great distinction to Australia’s performing arts at home and abroad." A 10 minute special performance of the November 99 Circular Quay Home Land season was recorded by ABCTV for the “2000 Today” Millenium Day telecast, which was screened in more than 60 countries. Homeland was presented in Berlin for the literaturWERKstatt Festival 2003, at the Manchester Commonwealth Games Arts Festival 2002, for the ABC's Today 2000 worldwide telecast, at the 2000 Brisbane Festival, for a 9 night season during the 2000 Sydney Olympics and as the opening event of Customs House Square 1998. Povik Ot IUk Dalechen the opening of the spectacular aerial choreography - 50 floors up! !